How many of us would know where to begin if we were suddenly confronted with a drowned surfer? The aim of this article is to give you a sound starting point from which to make a positive difference. Not to replace official training which is something all surfers should be considering. Most surfers, in their repertoire, have a story about the time they almost drowned, about the lessons they learnt and how their behaviour has changed. We regale our listeners with the sequence of events that led to the moment when everything got weird. Vision started to darken, thoughts started to wander, and how lady luck eventually gave us a helping hand. If you’ve drowned, clearly, you’re of absolutely no use to yourself. Your future now lies in the hands of those around you. Surfers, lifeguards and passers by. If you’re lucky. What they do in the seconds and minutes after you’ve drowned is crucial. The difference between life and death. Let me be clear. Drowning is the impairment of breathing (respiration) due to immersion or submersion in liquid. If you die from this impairment it is ‘fatal drowning’. If this impairment is interrupted it is called ‘non-fatal drowning’. Phrases like ‘near drowning’, ‘dry drowning’ and ‘secondary drowning’ are vague and I will avoid them. Be clear in the knowledge that technically, as the rescuer, the pressure should be off. If you do nothing with an unconscious non-breathing surfer they will certainly die. All you can do is help. Yes, be aware about neck injuries for example, but they are rare in drowning, and if they’re not breathing you can deal with the neck issue later if needs be. WHAT IS THE RISK OF FATAL DROWNING? A pro surfer said recently about his two wave hold down that ‘it is hard to drown’. He was correct. We are generally quite resilient. For all the scrapes we get ourselves into whilst surfing, the vast majority of us live to tell the tale. Surfers, you would imagine, are experienced in water and in reasonably good shape. Two factors that will reduce your level of risk. Drowning, however, is the sixth leading cause of unintentional death for people of all ages. What does that mean? The risk of fatal drowning when in water (not specifically surfing) is estimated (exposure adjusted time) to be 200 times greater than the risk of death from driving a car in the United States. Or there is 800 times more risk of death than when a fit and well person has a (non-emergency) general anaesthetic. Identified risk factors for drowning include male gender, risky behaviour and lack of supervision. Sound familiar?! ANY TIPS TO AVOID DROWNING? If you can’t paddle out then you shouldn’t be out. I’ve always liked that rule. Jumping off rocks usually is more likely to get me into trouble. I still occasionally do it. When you come up for air, breath out first rather than breathing in. Your first breath in, after your breath out, will result in more oxygen being in your lungs. Kicking uses up loads of oxygen. Use your legs wisely. General torment. If you’re conscious, that is. Holding your breath is a conscious act. You have a desire to breath that increases in intensity. This desire is increasingly driven by the carbon dioxide levels that are accumulating in your blood. Eventually this desire is literally irresistible and you breath in water allowing it to pass into your airway and lungs. This water causes coughing and in some cases laryngospam (vocal cords involuntarily spasming closed). Laryngospasm, if it occurs, will eventually break due to the falling level of oxygen in your blood. This falling oxygen level, if no rescue occurs, rapidly leads to you losing consciousness. Eventually and rapidly your heart starts to struggle, ceasing to effectively pump blood around your body until it stops. Call for help. This is crucial and obvious but often delayed. If you’re remote, send someone to go and call for help. If you’re in a remote location abroad hopefully you’ve planned your emergency numbers and where your help is coming from. In water, carrying out a rescue requires fitness, training and skill. As a rescuer you should prioritise avoiding drowning yourself! Sounds obvious but it’s often overlooked. If you are going to put yourself at significant risk by getting close to the person drowning, and they’re conscious, try throwing them a buoyant object to hold on to. In water, carrying out resuscitation with rescue breaths on a person who is unconscious is very difficult. 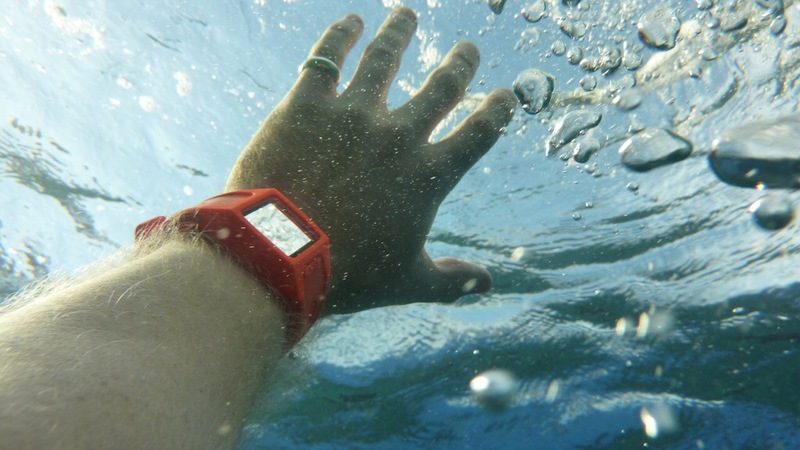 It requires a high degree of training and carries its own risks of drowning for the rescuer. It is, however, extremely effective if done correctly and increases survival chances three fold. Apply common sense. If you’re in the surf and don’t know what you’re doing, consider hauling them onto land. If land is way off and you don’t feel you’re at risk of drowning yourself, have a go at rescue breaths in the water but don’t delay getting them to land with failed attempts. Land is where this person needs to get quickly. Chest compressions in the water are ineffective and shouldn’t be attempted. Studies have shown that the only people to survive drowning where they have stopped breathing and don’t have a pulse (cardiorespiratory arrest) are the ones who received IMMEDIATE rescue breaths and chest compressions (cardiopulmonary resuscitation). To learn how to do this properly you need to be trained by a professional instructor with a manikin. Bad cardiopulmonary resuscitation (CPR) doesn’t work. There’s only so much you can pick up from reading a chatty, but well meaning, article on drowning (or ER for that matter!). If you don’t have training, try anyway. The only reason I know how to do this is because I have experience of doing it, but more importantly because I have had official training on it. It’s available to everyone outside of medicine too. It’s a nice thing to know how to do. If you come across someone unconscious in the water, you haven’t had training yet and you don’t have a clue, here’s my basic guide how..
Best done on a flat surface. This is such an important question. If you’re ever unfortunate enough to find yourself in this stressful rescue situation, try and clear your mind to focus on this question. Are they breathing? Remember that chest movement doesn’t always mean they are getting air in and out of their chest so be mindful of the patient’s airway. Lift their chin and extend their neck. Listen by their mouth for breathing. If you can’t hear any, is the chest moving or Adam’s apple ‘tugging’? Signs that their airway may be obstructed. Regurgitation of stomach contents is common when resuscitating someone who’s drowned. It’s just food, stomach juices and sea water. Get on with it. Don’t stop CPR to try and empty out the fluid. Delays in CPR are bad and reduce their chances of survival. If you’re trained with airway skills then experience and judgement may lead you to clearing the airway. 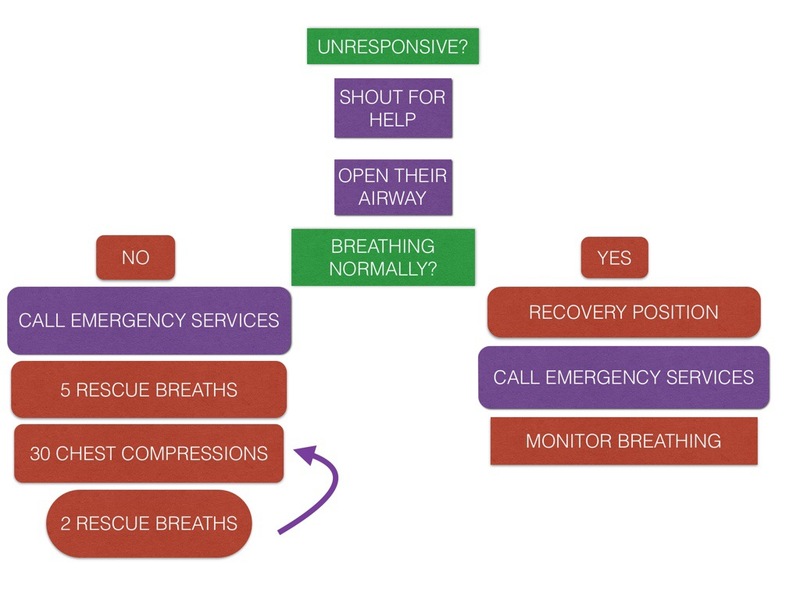 But if you don’t know what you’re doing, clearing the airway is confusing, time consuming and distracting from the important steps below. They’re breathing! – Put them in the recovery position and keep checking that they continue to breath. Keep them warm. If you’ve never heard of the recovery position before, google it now. They’re not breathing!!!! Then breath for them. Just have a go. Don’t waste precious time checking and rechecking that they’re definitely not breathing. At this point you don’t need to think about anything else other than getting air in and out of their chest. When someone drowns the problem is lack of oxygen. Giving 5 rescue breaths (mouth to mouth) to someone who isn’t breathing immediately addresses this problem. This is new (official) guidance and is different to all other CPR that starts with chest 30 compressions followed by 2 rescue breaths. The initial rescue breaths can be difficult to achieve because of the sea water in the lungs. This, and the problem of low oxygen, is why you start with rescue breaths and why there are 5 of them not 2. You’ve put oxygen in their blood, but is it being pumped around their body? Put you finger on their Adam’s Apple and slide off it to the side into their neck to feel their pulse. Practice on yourself now! I can’t feel a pulse!! Then start chest compressions. If you can’t feel a pulse on them it’s likely that there isn’t one, not that you just can’t feel it. Give 30 chest compressions. Google how to do this now. Feeling a pulse can be difficult. If there’s any doubt, you should get on their chest and start compressions without delay. Keep putting oxygen in their blood (2 rescue breaths) and pumping it around their body (30 chest compressions) until signs of life return. Don’t underestimate how exhausting CPR is. If you tire, swap with someone else. Don’t stop this cycle of 2:30:2:30 until professionals arrive and they take over. By all means check for a return of pulse, but don’t do this at the expense of continued CPR. If you feel ribs breaking, don’t stop or lessen the force of your CPR. Ribs will mend. Clearly if they regain consciousness and they ask you to stop you should politely do so..
Keep doing CPR until emergency services arrive or exhaustion prevails. Remember, if you can’t feel a pulse it’s because they aren’t able to pump blood themselves effectively. Your chest compressions, if done properly (google! ), should be pumping their blood for them. A non-medical general term to describe what can happen after lungs are exposed to fluid. To talk about the physiological effects of drowning and the advanced detail of its management is clearly beyond the scope of this article. That said,water in the lungs makes the lungs harder to inflate afterwards (breathing is tiring) and can make the lung membranes inflamed (wheezy) and leaky (fluid leaks into lungs from tissue). What does that mean? Be extremely vigilant of someone who has inhaled water. If there are any concerns, call emergency services and get them straight to a hospital. Talk to people. Even professionals if need be. Don’t underestimate the stress that this sort of experience can put on you afterwards, regardless of the outcome. Understand that self criticism is normal and inevitable. Doctors and nurses deal with these situations at work frequently. We often will naturally, through repeated exposure in the workplace, get used to them and the emotions we subsequently can experience after. It’s completely different in a situation where you are someone that just happens to be there. If you lose composure and think you did things wrong, don’t punish yourself. Anything is better than nothing. Basically, if I ever get washed up at your feet, just have a go! Szpilman D et al. Drowning. New England Journal of Medicine. 2012;366:2102-10. Carter E & Sinclair R. Drowning. Continuing Education in Anaesthesia, Critical Care & Pain. 2011. Vol.11 No.6:210-213.